It is necessary to reduce extreme inequality to overcome poverty; and extreme inequality in land ownership is one of the main drivers of social and economic inequality in Latin America. Addressing the challenge of inequitable distribution and control of land, territories and natural resources is necessary to reduce inequality in the region. Land and territory, and conflicts over its control and use, is a central issue in most countries where Oxfam works in Latin America. Much of the increasing violence, assassinations and repression against human rights defenders in the region is linked to such conflicts and the expansion of economic activities based on the extraction of natural resources (renewable and non-renewable) from the land. In Latin America, Oxfam works to promote fair access to land and natural resources and to expose and halt the impact of extractive activities on territorial and environmental rights and on human rights generally. Programs and advocacy seek to promote women’s transformative leadership and gender equality, to improve governance and stop the “capture” of policymaking by elites, to promote responsible business policies and practices, to secure individual and collective rights to land, and to reduce risks and vulnerability of human rights defenders. In the rural areas of Bolivia, there continues to be tension between the existing model of “extractivist development” based on natural resource extraction and an “alternative model” based on integrated management of natural resources and “vivir bien” (living well) at the local level that puts the interests of local actors at the center in constructing visions for development. There have been advances in the distribution and redistribution of land that have enabled the formalization of small properties for Original Indigenous and Peasant Territories (32.79%), for communities (15.82%) and for commercial production (5.59%). Democratization of access to land has been inclusive of women, who hold 46% of land titles. Oxfam accompanies the implementation of public policies on land in Bolivia, proactively contributing to the reduction of existing gaps in tenure and access to land in order to benefit original indigenous and peasant communities. With a population of 204 million, Brazil’s one of the largest economies in the world and an agricultural powerhouse. Despite this, inequality continues to haunt this country. OBR focuses on the underlying issues behind land rights. These include: economic inequality; urban inequality; private sector; and human rights. Touted as one of the countries with the highest levels of land concentration, the majority of conflicts in rural Brazil trace back to land. The political situation is complicated with land owners and agribusiness companies holding significant power and influence. To address this, Oxfam Brasil holds the private sector to account with zero tolerance on land grabbing in agricultural supply chains. Furthermore, Oxfam Brazil addresses the role of land concentration as a driver of inequality and injustice. 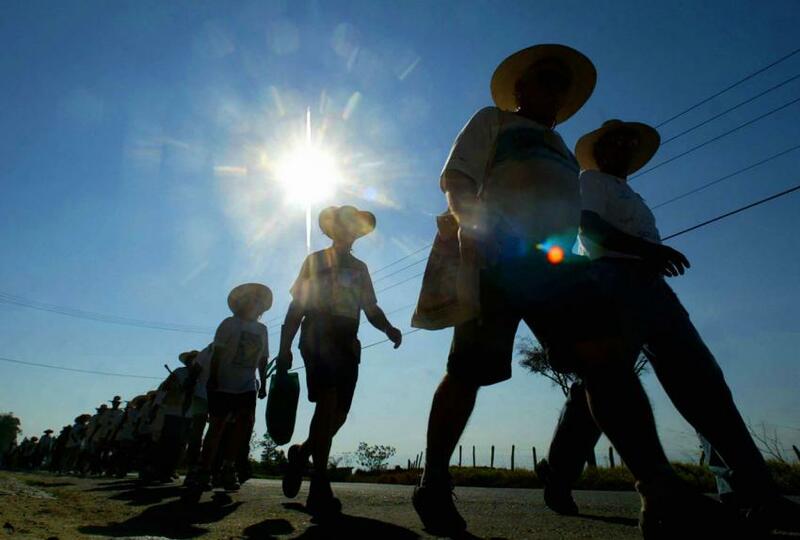 Oxfam Brasil launched a national land inequality report about the state of land concentration and the drivers, not only to land governance but also to agricultural policies, which was well received by media and civil society. See Terrenos da desigualdade: Terra, agricultura e desigualdade no Brasil rural below. After over five decades of armed conflict, a peace agreement between the government and the largest rebel group provides Colombia with an opportunity to foster inclusive development by addressing social and economic inequality. The extreme concentration of land that was at the root of the armed conflict must be addressed in order to build a stable and lasting peace. This inequality has affected rural women the most. Lack of access to land by Afro-Colombian, small farmer and indigenous communities has grown worse over the last several decades. A few powerful elites and large companies concentrate much of the land and are seeking to further expand large-scale agribusiness for palm oil, sugar cane and other commodity production, as well as mining and other “extractivist” activities. Although the country’s constitution directs the state to promote progressive access to the ownership of land for agricultural workers with limited resources, recent controversial legislative reforms enable greater land inequality. This generates more conflict in rural areas and increases persecution of land and environmental defenders. Oxfam works to empower rural women and their communities of small farmers, indigenous and Afro-Colombian peoples to ensure more equitable distribution of land and to protect the environment and the country’s biodiverse regions, particularly the Amazon. The issue of land tenure has historically been one of the main causes of poverty, inequality and conflicts in Guatemala. The issues of the extractive industries connected to the problems related to rights over land and territories hinder equal sharing of resources. The prevalence of expansion of agribusinesses (palm, sugarcane and rubber), mining and energy interests have caused massive displacement of indigenous and peasant families in their territories. As well as this, hoarding, and reconcentration of lands and violation of human rights and indigenous people’s rights have also been a cause of concern. Landless indigenous families in Guatemala often suffer extreme poverty and undernourishment that especially affect indigenous women and children. Oxfam has been supporting different civil society organizations in protecting and securing land rights for sustainable development and influencing the policies of government for complying to peace accords, specifically the accord related to socioeconomic aspects and agrarian situation. As well as this, the promotion of governmental policies and legislation that can warrant opportunities to land access and economic empowerment of women, peasants and indigenous people to secure their livelihoods and achieve their basic social development. Honduras is one of the poorest countries in Latin America and suffers from high levels of inequality. Land is concentrated in the hands of a wealthy few, who benefit from government support in the form of tax breaks, lucrative contracts, lax environmental regulations and fast track processes for concessions, which often violate international law. This rapid and aggressive expansion of mining, renewable energy and agroindustry in Honduras – frequently funded by international donors - has brought companies and local communities into conflict. Examples include the land conflict in the Bajo Aguán valley, as well as the opposition of Berta Cáceres and her organization, COPINH, to a hydroelectric project implemented in violation of ILO Convention 169. Honduras’ security forces typically act to protect companies, while the justice system criminalizes community leaders for their opposition. Oxfam works through local partners to ensure that communities are aware of their rights and have access to information on the projects that threaten them. We carry out research on the impacts of these projects and breaches of national and international law. We support community leaders to advocate for their rights with the Honduran government, companies, international community and international finance institutions such as the World Bank. Paraguay is marked by social, economic and gender inequalities. One in every two people in rural areas lives in poverty. Unequal distribution of land is a central problem, as Paraguay has one of the highest levels of land inequality in the world. A small but powerful landed elite, including foreign landowners, concentrates nearly all agricultural land. While most small farmer and indigenous families lack adequate land and are displaced from their territories to impoverished urban areas. This inequality lies at the core of Paraguay’s exclusionary economic model based on agro-exports and natural resource extraction, which prioritizes expansion of soybean and other monoculture over the population’s rights. It also has a harmful effect on health, resulting from intensive agro-chemical use and destruction of natural resources, with the Chaco region experiencing the world’s highest deforestation rate. This has generated conflict, resulting in growing violence and criminalization against land rights defenders. Oxfam works in alliance with local organizations and social movements to denounce the “capture” of public policies by elites and to promote an inclusive and environmentally sustainable model of development. Through projects, generating evidence and promoting international visibility for emblematic cases, Oxfam supports poor and marginalized communities in their struggle against inequality and for land rights. Peru is a country in which poverty and inequality continue to be a central problem, despite progress being made in macroeconomic terms over the past two decades. The national economy has grown mainly due to increasing exports of raw materials. This type of growth has increased pressure on natural resources, farmers and rural peoples’ rights. In that context, Oxfam in Peru’s Program on Territorial Rights and Extractive Industries contributes to creating conditions for equality and dignified livelihoods for people living in rural areas. The program promotes local people’s access and control over their territories, and advocates for the democratization of the political and economic decisions affecting their lives. Three main areas of work comprise the program’s work: the adequate implementation of prior community consultation and consent, respect for collective territorial rights of indigenous peoples, and empowerment of grassroots organizations to address issues affecting the natural habitats in which they live. In recent years the program’s work has focused on issues such as extractive industries (mining and hydrocarbons) in the Andes and the Amazon, and the expansion of agribusiness such as oil palm in forested areas of the Amazon.